I believe the last time Ran When Parked posted about a tractor, it was for for the sake of comedy more than anything. However, this is an story about an aging machine that has just as much soul as many of the old cars we feature here. I grew up in a part of northwestern Pennsylvania that leaned a little more towards rural than suburban. Some of my family had come from an agricultural background in the southern part of the state and furthermore, my grandfather had a fantastic 1948 Massey-Harris Pony for as long as anyone could remember (well, actually, since 1950). As a youngster I was heavily fascinated by farm machines and to this day still have collection of old die-cast model tractors. 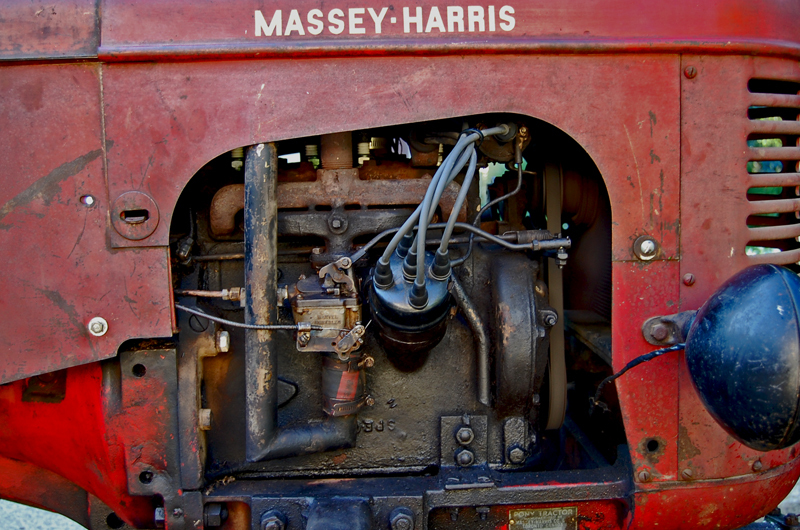 I always liked the old Massey-Harris, even if it did seem a bit scary when I was a toddler. It looked rather big (at the time), and was difficult for me as a kid to climb up on and off. Ergonomics were obviously not a big consideration in the design process and it features many pointy metallic protrusions and hard, sharp edges. It’s a far cry from modern ‘idiot proof’ machines that will shut themselves down if you get off the seat, feature guards over every spinning object, and have roll-over bars. 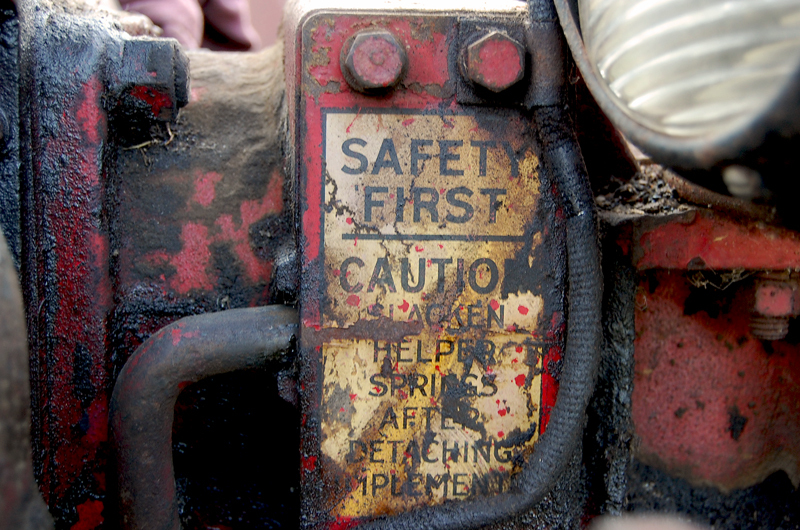 Pretty much every feature on the old tractor has the potential to cut, maim, crush, tear, or otherwise wreak havoc upon your body – more on that later. There is one safety sticker, however. Warning the user to slacken the “helper springs” on the lift after detaching an implement. 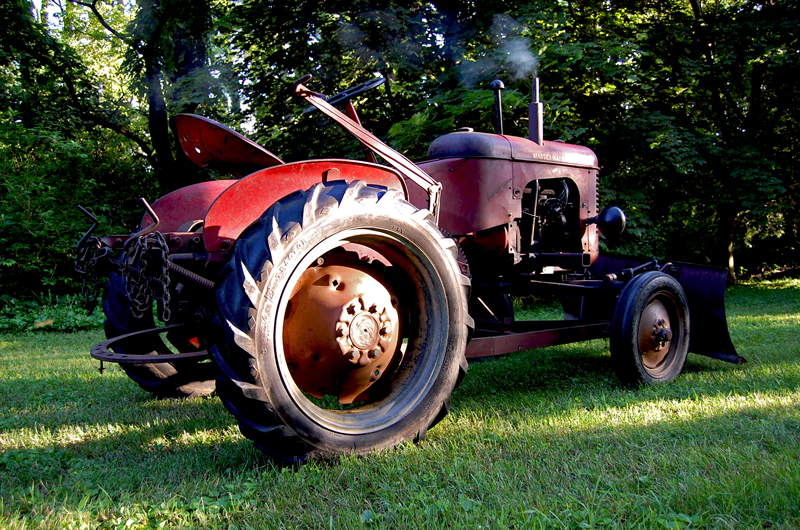 This Father’s Day weekend, about a year and a half after my grandfather passed away, his Massey-Harris was pushed out of his garage and basked in the full light of day for the first time in many years. I had it trucked to my garage and I immediately set out to get it’s Continental N62 powerplant running again. The battery had been dead for years and did not seem to interested in taking a charge. I felt, however, I could avoid buying a new one at the moment. After all, the tractor is equipped with a crank. My dad and I removed the engine cover and began by checking the basics. 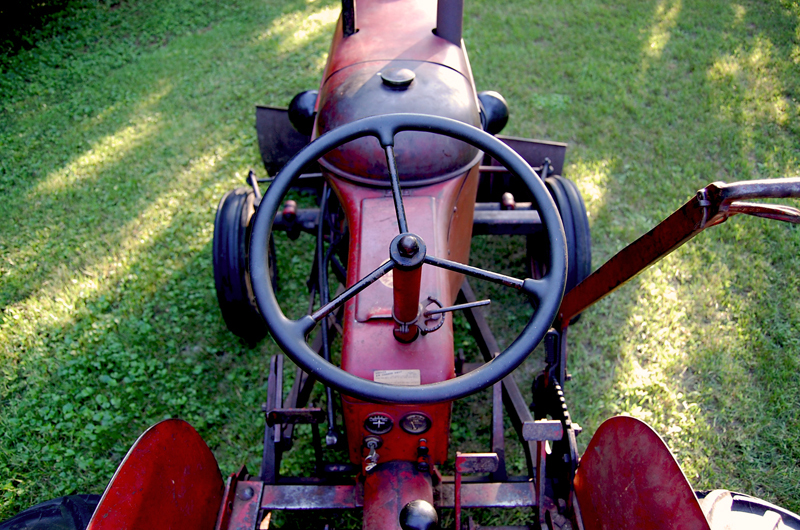 Compression was certainly there – cranking over even the relatively small 1.o liter 4-cylinder engine by hand takes a bit more effort than say, pulling the cord on a lawnmower. Fuel was also present as it could be seen dripping from behind the diminutive updraught Marvel Schebler carburetor. The spark plugs, distributor cap, rotor, and points gap all looked good and nearly like-new also. The only thing left was to ensure the coil was providing spark. I inserted a spark plug test-light into the lead of cylinder 4, made a shadow over it with my hand to watch for signs of life and my dad turned the crank. Sure enough, there was spark. It was made abundantly clear to me since I had failed to realize the palm of my hand was still touching a bit of bare metal on the tester. I’m not sure how much voltage exactly is put out by a 6-volt coil, but I assure you, it’s enough to get your heart beating faster. After a few more cranks the engine still didn’t seem to want to fire and the carburetor also seemed to be dripping much more gasoline. Perhaps it was flooding, perhaps the float was stuck. I decided to let it sit for a moment while I tended to other issues. I tightened up clamp bolts in the steering mechanism to help alleviate some of the excessive play, and I also tried further attempting to charge the battery (some hint of power, but not enough to turn the old Autolite electric starter). Finally I decided to give hand-cranking one more try. Half-choke, one notch down on the throttle lever. Several turns on the crank as rapidly as I could (at his point, blisters were appearing on my right hand). Much to my delight, a “brap brap brap” came from the exhaust pipe along with a bit of blueish oily smoke. It was running again – and it immediately settled right in to a happy smooth idle as if it had last run just yesterday. My father drove me to the emergency room as blood ran into palm from the paper towels and napkins wrapped around my left index and middle fingers. (My blood seems to be a slightly deeper red than Massey-Harris red.) The tractor managed to hack off one of my fingernails and split another, but at my digits are all still attached to my hand. I was at least content with knowing that the engine would run. The next day, with a neoprene glove on my left hand, I disassembled the carburetor for cleaning and removed a significant amount of ‘crud’ from the float chambers and sediment bowl. After reassembling and reinstalling the carb, I crank started the Pony up once more. I moved the throttle lever down a few notches, pushed in the choke knob, and engaged reverse. The old clutch grabbed with a bit of a shudder and the tractor rolled out of the garage under its own power. I engaged 2nd gear and set off into my yard (1st is low range and 3 is a ‘high speed’ transport gear). The gears in the final drive whined a bit and various squeaks and rattles emanated from the snow plow still mounted beneath. A bit of exhaust with a slight essence of oil occasionally wafted by. A rabbit watched curiously as I drove by at roughly 3.5 mph. There are a few more maintenance items left to attend to and some other details, but I plan to keep the Massey-Harris in good running but original and unrestored condition. It’s hard working days are in the past, but this Pony is far from being put out to pasture. It proudly shares a stable with German and Swedish cars, and in my opinion, is every bit as interesting. Previous post ← Is the Nissan Patrol (Y60) a future classic? my family had ford 8n’s, lots of 8n’s when i was growing up. i started driving them as soon as i was tall/strong enough to push in the clutch and turn the steering wheel. i though it was fun and they got free labor. all were sold off outside the family. i wish i could have bought at least one of them but it was not to be. tractors make me smile, 8n’s stop me in my tracks. i read your story early today and have been thinking tractors all day. thanks. i’m glad you were able to keep this pony in the family.